Omnisoft Technologies Pvt Ltd has been in the business of IT training since 1992. Having started operations with software training through LCC Infotech Ltd in 1992, Omnisoft has also imparted training programs in high-end software and ERP solutions like SAP and BPR solutions like Lotus Notes Domini, Lotus cc-Mail, etc. Over the years, Omnisoft has graduated from commercial training centres to providing employable, skill development training to the masses through the Government of Gujarat initiatives. Omnisoft Technologies has its own training centres are Baroda, Bharuch and Ankleshwar with state of the art network infrastructure and high-end computers to cater to the demand of today's bandwidth hungry generation. With technologies like Microsoft, Red-Hat, EC-Council (Certified Ethical Hacking), and CISCO behind Omnisoft, we provide standard as well as custom made training solutions to the corporate segment as well as the student segment. 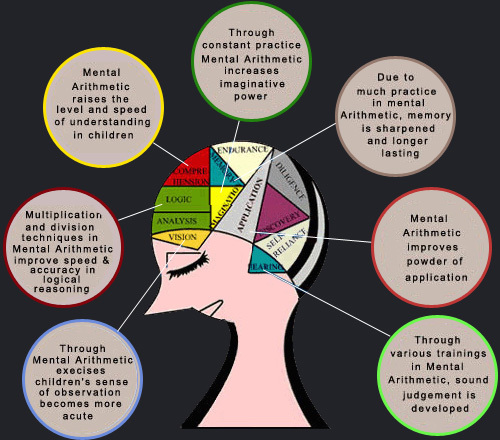 Universal Concept of Mental Arithmetic System (UCMAS) is a modern representation of an ancient art of mental arithmetic that has been adapted into programs to help stimulate children’s brain activity. The program was pioneered by UCMAS in Malaysia in 1993 and is currently offered in Asia, North America, Europe and Africa, in fact in 50 countries with close to 5,000 training centres. UCMAS was established in Gujarat in 2002, and is the leading pioneer of Mental Arithmetic programs in Gujarat. UCMAS is committed to ongoing innovation and advancement in the design and delivery of its curriculum and pedagogical methods. With its expertise in this field, UCMAS regularly updates its programs to ensure they continue to be world-class in quality and offer lifetime benefits for our students. UCMAS Education Group is an established institution that pioneered the UCMAS concept in 1993 in Malaysia. Over a million children in 5,000 centres worldwide have joined UCMAS in countries such as Canada, United States, United Kingdom, Spain, Malaysia, India, Sri Lanka, Middle East and Africa. UCMAS is an ISO 9001:2000 certified program and also adheres to global standards adopted to meet the needs of its growing student base. Need to challenge your child? Want to improve basic Arithmetic skills? Does your child have problems with focus and attention? Whether you're looking to further challenge your child or prepare your youngster for school or simply improve your child's arithmetic grades, our UCMAS programs are designed to meet your needs. At UCMAS, we are dedicated to enhancing children's development. We offer a unique opportunity for children aged 4 to 13 to participate in a program that contributes to full brain development by building their mental arithmetic skills. Our UCMAS programs have been described as 'Arithmetic Lego' and 'Mental Aerobics' as they are designed to help boost brainpower and stimulate young minds using the Abacus and Mental Arithmetic in a way that children find engaging and fun. The word is derived from the Greek word ‘abax’, meaning "calculating board" or "calculating table”. Mental arithmetic is the essential building block that replaces the physical Abacus in the child's mind. As the children gradually learn to visualise the Abacus in their mind (virtual Abacus), they learn to calculate arithmetical problems using the principles of the Abacus, without the use of the physical tool. The children become skilled in rapid mental arithmetic with the help of the physical abacus. Later, the children move on to mental calculation where they develop the ability to picture the abacus in their minds. The figures that are to be calculated are visualized as beads or images on the abacus, as opposed to numerals. This crucial concept of thinking in pictures leverages the right brain and leads to greater brain stimulation. Inspiring children's aptitude with numbers! UCMAS programs train children's minds for whole brain development, using the Abacus as a tool and Mental Arithmetic as a medium. The Abacus is the tool we use to teach children to understand various arithmetical concepts. By using the Abacus, children develop an ease and fluency with numbers. Manipulating the beads to solve an arithmetic problem provides them with another frame of reference to learn arithmetical concepts, which complements the system used in our public and private schools. When children use both hands to manipulate the beads, there is quick communication between the hands and the brain that stimulates both the right and left hemispheres of the brain. The Abacus/Mental Arithmetic reckoning process combines integrated thinking and motoring functions from both sides of the brain, so the left hemisphere (logical side) stirs the virtual abacus (image) on the right hemisphere (abstract side). Our rigorous training approach incorporates years of pedagogical design by child development experts to ensure our students can benefit from and be successful in our program. Visualization - the mental picture training boosts memory power, as the children practice holding the number in their mind while operating the physical or mental abacus. Flash cards - develop the skill of creating a virtual image of the beads on a mental abacus. By the end of the UCMAS program they have more than half a million images stored in their memory. The speed training prompts the children to respond to questions quickly. And the speed oral training encourages the children to listen attentively, which forces them to focus and concentrate. As the children become more familiar with the technique, they become certain of the answer, which in turn, builds their confidence and self-esteem. By activating both sides of the brain, children can achieve calculation speed previously only possible by arithmetic geniuses. Children will learn to subtract by adding; learn to multiply without multiplying; and learn to perform long division problems in their head faster than most people can add two numbers together. Scientists have been able to measure brain activity with the use of development of Magnetic Resonance Imaging (MRI). The discoveries that have resulted from recent MRI research are leading to breakthroughs in our understanding of brain development and how to enhance it. 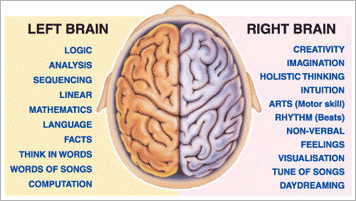 Our brain is divided into two hemispheres, the left brain and the right brain. About 90% of children use primarily the left brain, which is responsible for logic and analytical ability. The right side of the brain, which controls intuition, synthesis, creativity, and integration of information, needs to be developed and stimulated as well. Much of children's brain development occurs before the age of 12, with much of that development occurring in the first few years of life. Children aged 5 to 10 still retain significant "plasticity" (meaning adaptability) in their brain, which allows growth and inter-connection of brain cells. This neuroplasticity can be shaped through visual-motor integration and auditory-motor integration. For that reason, many experts recommend introducing children at a young age to a new language, to playing a musical instrument or to other mental development disciplines, as these activities stimulate the brain. It is also easier to acquire these skills at that tender age. In the same way, regular practice on a physical and virtual Abacus can help promote brain activity. Benefits that go far beyond better Arithmetic grades! Many of our students have had an academic improvement in their grades after completing the first few UCMAS levels. The lifetime value is the lasting effect our students gain, which will provide a solid foundation for future learning experiences. Of all the things we learn to do, arithmetic is one of the easiest mental processes that can be acquired. Most people, however, were never taught the simple techniques that can make learning Arithmetic so effortless that we can simply do it in our head. Once those techniques are mastered, we discover our own natural ability to quickly perform large calculations mentally. At UCMAS, we will teach your child how to use the Abacus and Mental Arithmetic techniques that will stay with them long after they've completed the program. Our philosophy revolves around creating child-centric programs that will benefit your child's mental development and in so doing will boost your child's emotional well-being. We have combined the established wisdom of Eastern disciplines with a modern outlook of a child's brain development with the goal of building a foundation of self-discovery as your child progresses through the program. Our other goal is to foster an environment for your child that will cultivate a lifelong enjoyment of learning and a particular love for Arithmetic. We know that Arithmetic is an essential and important subject in school and plays a fundamental role in future learning. We can only achieve all of this if your child is also having fun. We make learning arithmetic and mastering arithmetic calculations enjoyable and engaging for your child. Our experience has shown us that the best way for a child to learn and to progress in Mental Arithmetic is through practice, both in class and at home. We offer our students a reward program of UCMAS™ Points to help keep them interested, practicing and progressing! Parental support and involvement at home is a key success factor for the child to progress well through the program. The Abacus and Mental Arithmetic complements the teaching approaches used in schools. Educators in Asia site Abacus and Mental Arithmetic usage as key reasons that children in these countries consistently head up the rankings in international arithmetic comparisons. Using our UCMAS approach has helped a million children worldwide to 'discover the genius' within.